Together they straddled the dichotomy in my mind. I needed more opinions. There was no need to contact Miss Manners on the subject because I found I have had her for a friend all this time. Oh my. There is no telling how many times I may have offended her over the years. But before I had a chance to make up my own mind I was off to the Association of Writers and Writing Programs (AWP) in Seattle, where I would have the opportunity to query more writers on the subject. Being the largest annual literary event in North America, an event Sasha Weiss describes in The New Yorker as “a giant reunion of English majors thrilled to be back at school,” it comes as no surprise which side I came down on. First I intended to ask JC Sevcik, a born writer. JC was participating in a panel discussion “Strange Families: Domestic Stories Illuminating Social Issues” at The Sheraton, just steps from the Washington State Convention Center. Conference rooms at the Sheraton are named after trees, so slinging my bag over my back I hiked past Douglas, Aspen, Cedar, Spruce, Madronna, and Willow to find him in the Redwood Room, straightening the tables in preparation for the event. 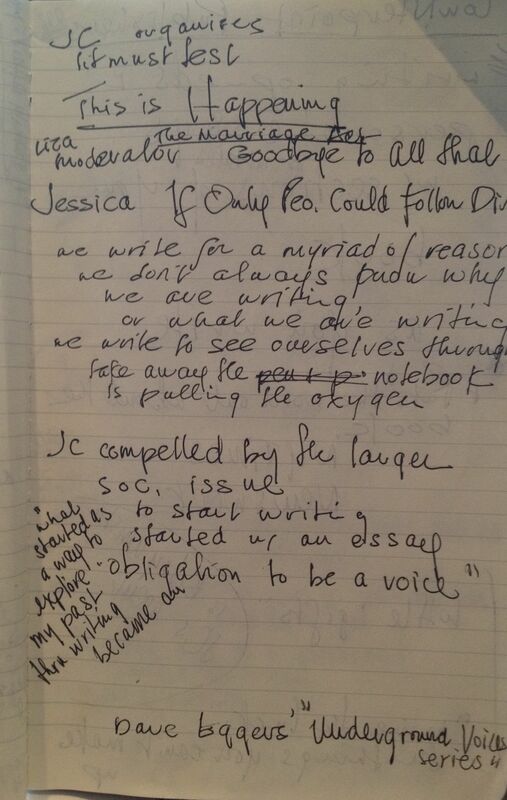 But then I took a seat, realizing that in all the time I have spent with JC, I have never seen him take notes. Yet he never misses a thing. I think he’s just so darn bright, and younger than some of us. I got out my notebook and pen and waited. In any case, the question was answering itself. In the final hour of the final day of the conference, I met up with a couple other writer friends. Exhausted, we sprawled on the floor and I posed my question to them. They looked at me incredulously. Now I don’t know how I ever saw it any other way. We must be up front about being writers, much like photographers shoot pictures and artists sketch. Notes are what we have to mine when we sit down to write. Notes spark stories, indeed, novels. I knew all this of course, but for some reason I had to circle back and rally around it. “Take a ridiculous amount of notes.” Midge Raymond continues. And I will do just that. Riding home, some of the boys on the bus with me have ear buds connected to music the entire trip, and all day long for all I know. I never meet them, but I know it’s music they love. It’s all good. It’s all art. And no one is hurting anybody. Stegner’s memory must have been superb. Mine, on the other hand, can be like an etch-a-sketch when I get up and walk away from the table.